Optimization of the power supply is one of the keys to the success of large industrial projects. Enedis and RTE are therefore natural partners with Dunkerque-Port and the Urban Community of Dunkerque in meeting the industrial and logistics challenges of the region and in building in advance - that is to say before knowing who the industrial end-customers are - an electrical substation, in record time, by 2021. It will be located on land in the West Port of Dunkerque and will convert 225 KV to 20,000 V, the total investment representing some 11 million Euros including tax. It will provide an initial power supply of 80 MW, in addition to the 40 MW still available within the precinct of the Major Seaport of Dunkerque (GPMD). Set up to respond to the significant increase in future electricity requirements of the industrial port area of Dunkerque, the exemplary partnership is innovative for more than one reason: the substation has been co-financed by Enedis, RTE and the Major Seaport of Dunkerque, and the construction time has been halved compared with standard lead-times. Enedis is a utility company, manager of the electricity distribution network. It develops, operates and modernizes the medium and low voltage power grid and manages the associated data. It handles customer connections, 24-hour troubleshooting, meter reading and all technical interventions. It is independent of the energy suppliers who are responsible for the sale and management of the electricity supply contract. RTE,, Electricity Transmission Network, is a service company. Our basic mission is to ensure all of our customers have access to an economic, safe and clean electricity supply. RTE connects its customers with a suitable infrastructure and provides them with all the tools and services that allow them to use it to meet their needs, with a secure, stable and sustainable electricity supply. To do so, RTE operates, maintains and develops the high and very high network voltage. It is the guarantor of the proper operation and safety of the power system. RTE transmits electricity between electricity suppliers (French and European) and consumers, whether they are electricity distributors or directly connected to the power grid. 105,000 km of lines between 63,000 and 400,000 volts and 50 cross-border lines connect the French network to 33 European countries, thus providing the opportunities for electricity exchanges essential for the economic optimization of the power system. RTE has 8,500 employees. Ensuring the well-being and solidarity of the inhabitants of the urban area, while promoting its coherent, environment-friendly development has been the aim of the Urban Community of Dunkerque (17 municipal districts; 201,380 inhabitants) ever since its inception. A range of resources enriched and renewed in recent years through experimentation and innovative approaches in favour of an exemplary energy transition: the forthcoming establishment of an offshore wind farm off Dunkerque, commissioning of the largest LNG terminal in mainland Europe, management of the GRHYD project to test the use of hydrogen in transport and housing, and the installation of an industrial pilot for second-generation biofuels. Major initiatives that the Urban Community has supported by stimulating the emergence of a formative energy sector, examples including the Energy 2020 centre of excellence, the Innocold Refrigeration Technology Institute or the Euraenergy site. The leading French port for non-oil industrial traffic (48 MT in 2018), the largest land reserve for conversion north of Paris, Dunkerque-Port is the port for all types of energy and industry. 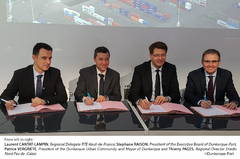 In order to support the dynamism of industrial development on its platform, the GPMD foresees the future alongside the technical operators RTE and ENEDIS and its everyday and long-standing partner, the Dunkerque Urban Community (CUD).